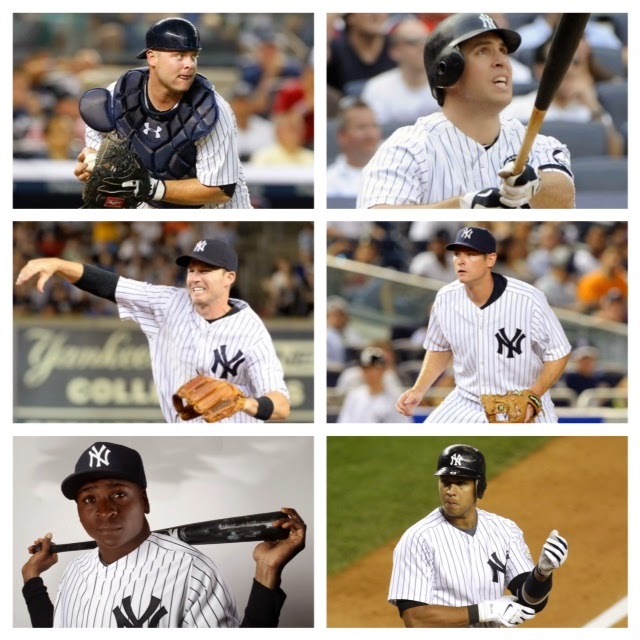 In part 3 of the optimist series, we take a look at the 2015 New York Yankee infield, one filled with many question marks. A combination of youthful startups with seasoned veterans leaves for little certainty as to how things will play out. I have very high hopes for our first guy, Brian McCann. He is literally the model player for the Yankee franchise: a leader, hardnosed, durable, and a lefty bat. I got a sense throughout last year that McCann just wasn’t quite comfortable yet in pinstripes- considering the enormity of the transition he made, this is understandable. As the year went on however, he appeared to relax a bit and find it down the stretch. I look for a big season out of him now that he’s fully adjusted and settled in to the New York atmosphere. Backing him up is John Ryan Murphy. Following the trade of Francisco Cervelli early on in the offseason, it was made clear that New York views Murphy quite highly, as he is now second in line at such a young age. This is certainly deserved however, as he has performed quite nicely in limited playing time over the last two years, and his clubhouse presence and work ethic have made him something sort of a fan favorite. To begin with, Mark Teixeira enters his age 35 season coming off another disappointing year. Still, there is reason to be at least partially hopeful. Remember last season he came in having not had a full and complete offseason due to the fact that much of it was spend rehabbing following his wrist surgery. Just as Derek Jeter failed to prove able in 2013 following an offseason of such similarity, I feel that this is what occurred with Tex in 2014. Hopefully this year, coming in off a healthy offseason, he will better be able to help the team on both sides of the ball. Backing Tex up is veteran Garrett Jones, who the Yankees acquired from Miami as part of the Prado deal back in December. I like Jones because he serves as a valuable pinch hitter who, with one swing of the bat, can tie a game or give the team the lead. This is something New York has lacked in recent years, and is an essential component of any good team. With a swing tailor-made for Yankee Stadium, look for Jones to serve as a valuable asset off the bench and as an injury reserve at first base. At second base, the situation is certainly more unclear. As undesirable as this sounds, I would have to wager that manning the position on Opening Day will be Stephen Drew. While on the glove side he is of positive utility, it’s at the plate where any hope vanishes. Perhaps he’ll be able to somehow near duplicate his 2013 stats, but even while reading an optimistic article- don’t count on it! Next we have two youngsters of comparable description- Jose Pirela and Rob Refsnyder. I personally would prefer either of these guys over Drew as they are younger and provide a much needed spark. Both impressed at the plate in the minor leagues and Pirela even got a chance to show his skills on the biggest stage of them all towards the end of last season. On the glove side questions marks exist, as both have been stationed all over the ball field throughout their minor league stints- never really having settled in a position. Ultimately, I don’t believe both of these guys will make the roster, so it will be interesting to see how Spring Training unfolds, as both of these guys will be players to watch. Third base is pretty straight forward (no, not A-Rod) as Chase Headley comes in with a nice new four year contract. This was an offseason move that I liked a lot, as I thought Headley was very good last year and, relative to what was available, was a necessary resign. Offensively I believe the switch hitter should be poised for a solid year with a more legitimate lineup around him that what he had in San Diego as well as now playing in a much better ballpark for a hitter. On the glove side, if his short stint with New York last year was any indication, he and the Yankees are set- for he’s outstanding defensively. No Derek Jeter this year. How am I supposed to brandish any sort of optimism with that being an inherent truth? Anyways, we do have an exciting 24 year old formerly from Arizona, that being Didi Gregorius. His statistics were underwhelming but, similar to how I view Nathan Eovaldi on the pitching side, but I just see something more out of Didi- he’s just too talented and too athletic to not pull through. I expect him to compliment the bottom of the order nicely for the team, and offer some much needed durability which is seemingly par for the course with someone of his age. Backing him up is the all too familiar Brendan Ryan, who Yankee fans do not like hearing much about. Ryan, a “defensive specialist”, was abysmal (as expected) at the plate last year, but also wasn’t too good in the field either- I remind you this is the only reason he has a job. Anything above the Mendoza line has to be looked at as a winning scenario for New York, and hopefully he finds it again with glove which is was that made him of any value at all. I’m not sure if this really counts as an infield position but the guy predominantly filling this role, Alex Rodriguez, has been an infielder his whole career so why not? I could write a whole article on A-Rod so I don’t want to branch off too far into off the field occurrences, but rather just stick to his on the field play. This is quite a mystery to me, as part of me wants to think that a full year off and an entire fan base that needs winning back may motivate and even super charge him back to legitimacy. Then again, at age forty with a broken down body riddled by longevity and substance abuse, perhaps he’s done. Either way, it will be interesting to see how things unfold for Alex, a guy who has been no stranger to the unbelievable in the past. I feel it begs to mention: currently, and as most of us know, Yoan Moncada has been cleared to sign with any team and the Yankees are being viewed as a potential favorite for the Cuban phenom. The potential acquisition of him would change the entire discussion regarding the situation at second base, and for the entire infield and makeup of the team, for that matter.